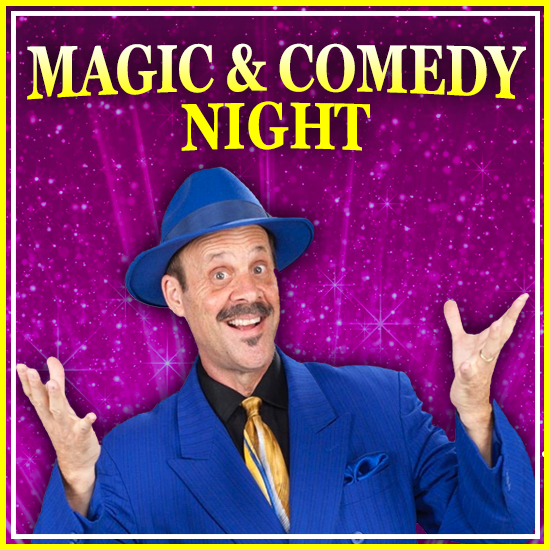 Magic & Comedy All Stars featuring Magician Phil Ackerly and Comedian Jeff Applebaum with special guests! Phil Ackerly – Bay Area’s Favorite Performer / Phil left his cushy job working for a Silicon Valley high tech company and became one of the busiest performers in the Bay Area. He has captured first place awards for his magic, comedy and close-up sleight of hand from leading magic organizations. He’s a featured performer at the Magic Castle in Hollywood, Off Broadway at Monday Night Magic in New York and The California Magic Dinner Theater in Martinez. Jeff Applebaum – Comedian / We are excited to have Jeff on our program again and he is a real funny guy and crowd pleasure. After 20+ years in California, this New York City native is finally learning to understand the local language. Jeff made his national U.S. TV debut on CBS as a comedian on the “Late Late Show with Craig Ferguson.” He has also appeared on Comics Unleashed and Comedy TV. He has performed with comic legends Robert Klein, Richard Lewis, Robin Williams, Kevin Pollak, and Jake Johansen. Fred Lee – Mentalist / We are excited to have Fred Lee, Bay Area Mentalist returning to our show. Fred has been wowing Fortune 500 companies and various distinguished clients in 3 continents with his miracles of the mind, Fred Lee shares a unique style of entertainment to his audiences. Fred will touch your mind whether you like it or not, demonstrating that nothing is impossible. Sy Hoff - Comedy Magic from this local favorite, Sy Hoff has performed at private events and on stage at Rooster T Feathers. His magic will astound you. Nicole Tran - You'll love Nicole and you'll love her comedy. Nicole studied acting and dance at Ohlone and Foothill College. She performed at Rooster T Feathers, Tommy T’s, The Punchline, Cobbs Comedy Club, Comedy Oakland, and Granada Theater Morgan Hill. and a special surprise guest!